The fishing industry startup has utilized technology to take pain points away from new angler consumers - making previously prohibitive gear affordable and accessible to millennials. Recur Outdoor’s brands (Postfly, The Wade Rod Co., and Pelican Reels) have generated millions in revenue and delivered hundreds of thousands of gear shipments to anglers worldwide since their 2013 inception. The company has allowed its customers and fans to invest via Wefunder’s equity crowdfunding platform, and will close the campaign on Feb 28, 2019. Link to Wefunder campaign. There are only a few weeks remaining on the Recur Outdoors, Inc. Wefunder campaign (Wefunder.com/RecurOutdoors), allowing customers, fly fishing enthusiasts, or outdoor industry investors to own a piece of the growing company. The campaign will end on Thursday, February 28th, 2019, at midnight, EST. Recur Outdoors Inc., which operates the brands Postfly, The Wade Rod Co., Pelican Reels, and GuideHire, is changing the way anglers buy their essential gear. Rather than relying on sparsely located brick & mortar shops, anglers can create subscriptions online to receive fishing gear like flies, lures, rods/reels and more, based on where and when they fish – all at a fraction of the price of conventional retail. The cash-strapped, tech-savvy, millennial angler doesn’t have time to drive hours to a shop. Instead, they can get everything they need to get on the water and catch fish, delivered right to their door every month. Recur Outdoors is tapping into prevalent consumer shopping behaviors - like subscription services, recurring payment plans, and ASAP delivery - and bringing them to an antiquated industry. Postfly, the first subscription-based monthly flybox, aims to help new fly fishermen break into the sport. By curating flies, fishing accessories, and fun branding products in one monthly box, Postfly is a $120k per month business. Now, the business has expanded into two new digitally-native vertical brands, (The Wade Rod Co. and Pelican Reels) which utilize a recurring revenue subscription model to make prohibitively expensive gear affordable to new anglers. Together, the monthly subscription possibilities could redefine the gear industry and bring a wave of new young anglers to the sport. Over 4MM revenue to date; $1.7MM in 2018. We currently have over 7,000 paying monthly subscribers between Postfly and The Wade Rod Co. Monthly subscriber retention rate averages at 94%. 200K+ shipments made to our customers. More than 200K combined followers for our social media channels. Tech-enabled kiosks to sell our higher price point, higher margin, Wade Rods and Pelican Reels expected to rollout spring 2019. Raised $550K in earlier seed rounds. 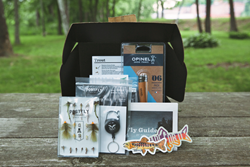 Recur Outdoors started with the Postfly subscription box, providing flies and educational material to anglers every month, and has now expanded into rods and reels. This push puts the subscription model into every step of the gear-buying process, making fishing more accessible to anglers of any skill level. Considering more Americans fish (46M) than play golf (21M) and tennis (13M) combined, this is a huge market opportunity. The goal of Recur Outdoors is to become the top e-commerce destination for anglers, especially those new to fishing.